TRAINS AND DARTS will not run today due to a strike at Irish Rail which will affect over 150,000 commuters. This is the first of five planned days of industrial action and it’s expected to cost Irish Rail €900,000. The other dates due to be affected are 7, 14 and 23 November and 8 December. No further bookings are being accepted on these dates due to the proposed action. Siptu members at Irish Rail had voted by 84% in favour of industrial action. National Bus and Rail Union (NBRU) members, meanwhile, voted 92% in favour. The National Bus and Rail Union (NBRU) says that the strike revolves around a lack of pay rises for staff over the last decade. It has also claimed that members have not received a pay rise in the last 10 years. 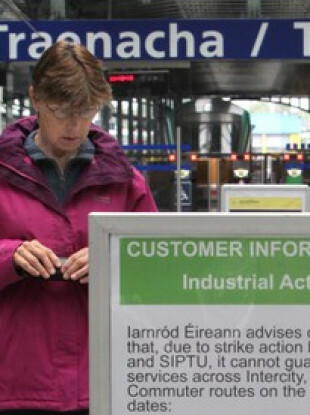 In a statement Irish Rail said, “It is not possible to provide alternative transport on dates of industrial action”. Other transport operators do not accept rail tickets on the days of strike action. If you have booked to travel by train on the dates of the strike, Irish Rail says it will cancel your booking and you will be automatically refunded seven days prior to your date of travel. It also noted that it can take 3 – 5 days for financial institution to process the refund. If you bought a monthly or annual season ticket – including through a company as part of the Taxsaver scheme – you can apply for a refund for the days impacted by the industrial action. Irish Rail says these refunds will be processed at the end of the industrial action in a single process. It says a dedicated refund form will be available online for customers at the end of the industrial action. Finally, customers who purchased a ticket at the station are advised to collect a refund form at the station or at Irishrail.ie and return to the address outlined. Email “Here's how to get your refund if you're affected by the Irish Rail strike”. Feedback on “Here's how to get your refund if you're affected by the Irish Rail strike”.